For all of the things they can do for you, the term “camping chair” is too limiting. 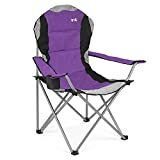 You can use them when you have visitors over and need a few extra seats, when you go to a sporting event and need a place to sit in the parking lot, or, yes, when you go camping. 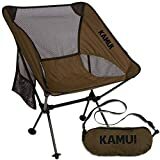 Camping chairs have come a long way since their days as flimsy folding chairs that were guaranteed to break down after a few uses—and to be uncomfortable even when they were working properly. Today’s models are almost as comfortable as the chairs in your living room, and even more versatile. Here’s how to find the best ones for your needs. Traditional: Traditional camping chairs are straightforward, no-nonsense seats. They’re designed to set up quickly and provide stability even when the ground is uneven. If you’re just looking for a simple chair—and probably looking for a more affordable model—a traditional chair is probably the way to go. 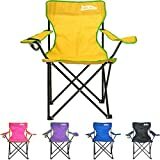 Camping stools: Camping stools are even simpler than “traditional” camping stools. They provide a seat and legs, and nothing else. Even though they might not be quite as comfortable as traditional chairs, camping stools tend to be much smaller and more compact. That makes them perfect if you need to store a lot of camping gear and need to save as much space in your car as possible. 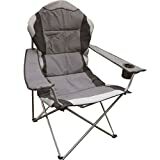 Reclining: Reclining camping chairs feature hinges that allow the user to pivot a bit, so that he or she can lean back a little. 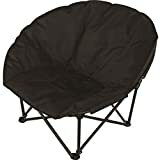 While it isn’t as comfortable as the recliner in your living room, this type of camping chair can provide a nice way to relax at the campsite. Comfort: This is the most commonly remarked-upon quality of chairs, and with good reason: there’s no point in spending money on a chair that you don’t want to sit in. The best models are easy to get in and out of, and comfortable enough to sit in for a long time. Sturdiness: Some models trade durability for being lightweight, but the best brands don’t do this. Instead, they produce chairs that are light and mobile, while still being able to support a wide range of users. 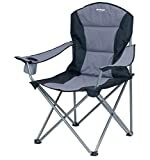 Weight: A comfortable camping chair won’t be of much use if it’s also heavy and bulky. Better models are light and easy to move and pack into the car, while still being comfortable. Adjustability: This isn’t an option on all chairs, but it’s nice to be able to adjust how far back you’ll lean when you’re sitting in the chair. Capacity: Each chair comes with a specific weight capacity. While chairs will generally take a bit more weight than the stated capacity, be sure to pay attention to it when purchasing, as it can affect the chair’s long-term durability. Size and weight: When you check out a chair online, be sure to look at its dimensions. In particular, how big is it, and how much does it weigh? Those two factors will give you an idea of how easy it will be for you to load it into your car along with anything else you need to bring with you. Add-ons: Some chairs are just that: places for you to sit. Others come with a variety of additional options, from cup holders to footstools. Material: While chairs’ frames will generally be some form of either metal or plastic, the seats and backs will come in a variety of materials, each of which has its own particular amount of flexibility, air flow, and so on. Coleman: The name Coleman is practically synonymous with camping. Since its founding in 1900, this American manufacturer has been the industry leader in camping equipment and other outdoor goods. ALPS Mountaineering: ALPS Mountaineering is an American outdoor goods company. It was founded in 1993 by a veteran of the industry, and produces tents, sleeping bags, and other camping equipment, including camping chairs. Ming’s Mark: Ming’s Mark is an American outdoor manufacturer based in Arizona. 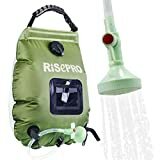 The company produces a variety of camping goods including a line that is specifically designed to be environmentally responsible. 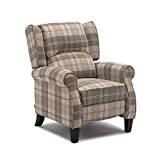 TravelChair: Like the other companies on this list, TravelChair is an American manufacturer. 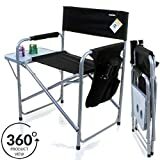 Unlike the others, the company has a much tighter focus: instead of making a variety of camping goods, as its name implies, it produces camping chairs (along with portable tables).